The Replace Stuff Mod adds a new replace button in the Architect menu that allows replacing any building’s materials without destroying it first. Replace the stuff that a thing is made from, e.g. replace a wooden wall with slate wall. Build over rocks, ore, or in undiscovered areas and it will be cleared out for construction. New Over-wall Coolers so you don’t need to break a wall to install a cooler. They behave exactly like normal coolers, but do not act as walls, and must be placed on top of walls. Place buildings on top of existing buildings with new stuff, and their materials will be replaced. Replacing walls doesn’t break the room, and keeps freezers indoors and cold. Replacing workbenches keeps the bill list. Replacing beds preserves their owner. The Work Needed to build is the same as normal deconstruction and construction. Materials needed is just the stuff to be replaced. Any additional materials are preserved in the building and not lost. Buildings with quality are assigned a new quality level. When building over rock, miners and builders will both mine. If it’s valuable ore, unskilled miners will lose ore. You may want to cancel your building projects until the skilled miners do their job. You can build in undiscovered areas, but after revealing a new area, invalid blueprints are canceled, often due to terrain. Even building floors will clear out rock to install the floors. The Replace Stuff Mod is not compatible with JTReplaceWalls, but it already comes with all of its functionality. 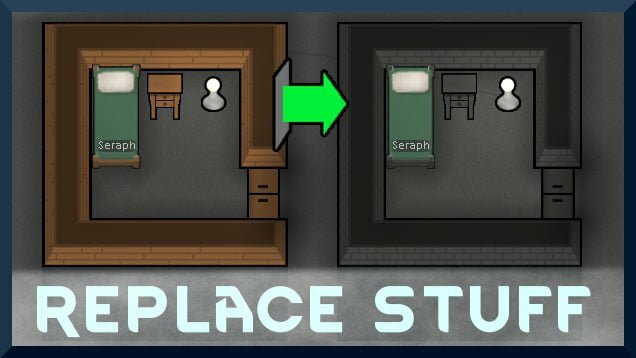 The Replace Stuff Mod is definitely a time saver, a way to quickly improve the state of your colony without having to deconstruct and reconstruct everything. In addition, keeping the bills of the buildings is greatly appreciated.